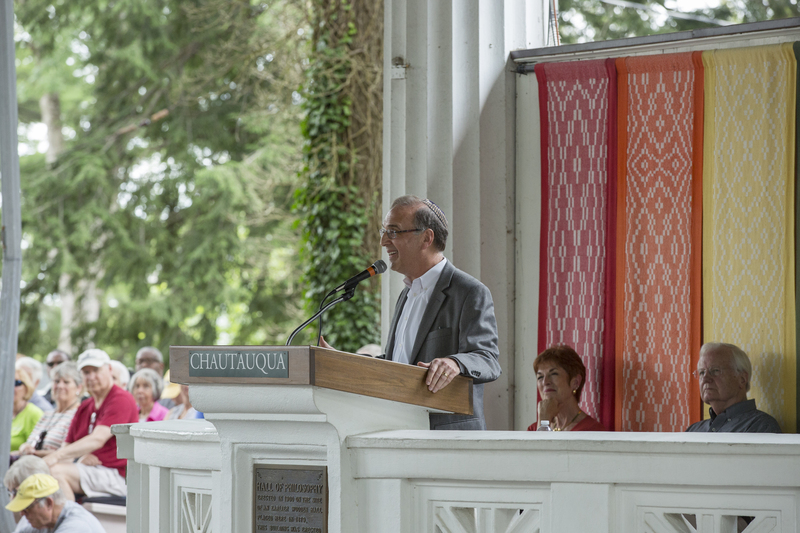 I recently had the opportunity to speak at the Chautauqua Institution (CI) about the “Crisis of Faith” in America. For those unfamiliar, CI was founded in 1874 by Methodist Bishop John Vincent as a summer camp for Sunday School teachers on the shores of Lake Chautauqua near Jamestown, NY. Today, CI functions like a summer camp for the NPR crowd, the days filled with internationally known speakers and the evenings replete with symphony, opera, ballet and theater. This article appeared in the New York Jewish Week on August 29, 2017. Each of the ten weeks of the CI summer season is built around a theme and “Crisis of Faith” proved especially popular. The CI community has not yet outgrown its WASP roots although Jews are said to make up as much as 25% of the attendees today. A few years ago, the Everett Center was established, named after Jewish philanthropist Henry Everett, and it gave Jews their first permanent home on the grounds, joining the houses of virtually every Christian denomination in America. The marquis draw of the week was journalist Bill Moyers. Best known for his PBS specials, Moyers is a man of prodigious intellect and a record of public service that dates back to his role in the Kennedy Administration where he was one of the architects (and then deputy director) of the Peace Corps. Unknown to me before I had a chance to spend some time with him, was that he got a Masters of Divinity from Southwestern Baptist Theological Seminary and has been a person of deep faith for all of his life, worshipping most Sundays at the historic Riverside Church on the upper West Side of Manhattan. Moyers framed each day’s presentation, interviewed the speakers after their lectures and then spoke himself on the final day of the week. My antennae were already sensitized to the challenge that lay ahead when the speakers of the week were all asked to join a call with Bill Moyers about a month before the program was to take place. Moyers asked us if we intended to speak about our own “crisis of faith” or about the crisis being faced by the faith communities we represented. To a person, we all assumed we were being asked to take on the latter assignment although I sensed from Moyers some surprise, if not disappointment. In my presentation, I spoke about my work with rabbis and American synagogues. I drew a correlation between the declining membership numbers in synagogues and the parallel decline taking place in most mainline Christian churches. I also highlighted the success of synagogues that were powerfully mission-driven, where the spiritual leaders make a clear connection between inner, personal transformation and the work of social transformation that we need to do in the world at large. I also spoke about what we are learning in the new national initiative that I am leading-Kenissa: Communities of Meaning Network. I argued that even as the stewards of historic religious communities believe that the next generation is engaged in a wholesale abandonment of the institutions they have built, in fact, religious identity is being re-invented in exciting new ways. But perhaps even more interesting to the 1,000+ people in the audience, was how differently I framed the “Crisis of Faith” for the Jewish community as compared to how Christians spoke about the same topic. Jews are quite adept at engaging in interfaith dialogue. 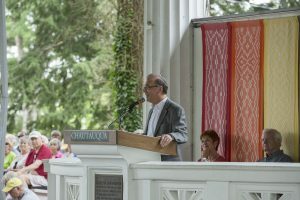 Even though Jewish organizations and clergy have been deeply engaged in interfaith dialogue in American since the mid-20th century, the terminology for the conversations are usually Christian categories. As the minority sub-culture at the party, we play by the rules and definitions set by the majority culture. Christians are accustomed to speaking about themselves as “faith communities”; Jews, not so much. Jews are less a “community of faith” than they are a “community of fate”. Jews are not united by a common understanding of God, a common lexicon of liturgy, or a common observance of ritual. Those matters of “faith” are hardly shared within one denomination or one synagogue no less across the full range of Jews in world. But as a “community of fate” Jews do feel a powerful sense of connection to a shared history and a common destiny. If Jewish behavior were to be defined by one core phrase, kol yisrael arevim zeh bazeh, “all of Israel is responsible, one for the other”, would be a far more accurate descriptor than “shma Yisrael…”. And while some rabbis might bemoan that fact, I would argue that the sense of mutual responsibility that Jews have acted upon, generation after generation is, in fact, the secret to Jewish survival. Many a Christian colleague has remarked to me over the years how Jews don’t seem to attend worship services, they have the lowest “belief in God” quotient of any religious sub-group in America and they are not particularly observant of Jewish rituals at home. How is it, they ask, that Jews stand in greater solidarity with one another than do Christians? In my experience, it is because for Jews, “belonging” has always been more compelling than “believing”. Even as we document the weakening ties to Jewish identity among Next Gen Jews, the “community of fate” factor is still powerfully at work. However, increasingly, that loyalty needs to be “earned” and that can only be accomplished to the extent our community continues to prove itself to be one of “sacred purpose”.